Be the first to share your favorite memory, photo or story of Norma. This memorial page is dedicated for family, friends and future generations to celebrate the life of their loved one. Norma Lee McGaha, age 86, a New Castle resident, passed away peacefully at home on March 18th surrounded by her family. She was born January 25, 1933 in Cumberland County KY, and moved to New Castle as a child with her parents, the late Charles and Pauline Sewell. 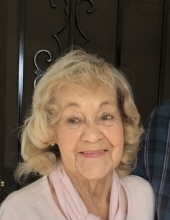 Norma started working at Denton’s Drugstore at age 16 and for several years worked for Modernfold Industries, later working for Addison House as a QMA caring for others. She was a strong and loving mother, wonderful friend to many in the community and an active soul that seemed to always be smiling. Norma enjoyed oil painting and had a passion for cooking. She was an avid fisherman, spending time casting a line at Westwood Lake and other “secret” fishing holes. From time to time one might find her at Hoosier Park trying her luck or at the American Legion Post mingling with friends. Norma also found more Morel mushrooms throughout Henry County than anyone could ever consume. She was preceded in death by three brothers, Charles, Glen and Carlos Sewell. She is survived by her friend, Fred Beam, two sons, Mitch Fellers and his wife, Mary of New Castle, Jay Fellers and his wife, Stacy of Frisco, Texas, Angel Tait, Dawn Tait, Jason Tait and wife Desiree, Jeremy Tait, Charles Fellers and wife Michelle, Luke Fellers, Erin Fellers and husband, Zach Costa, and 17 great grandchildren and 10 great –great grandchildren. Family and friends may call from 4 pm to 8pm on Thursday, March 21, 2019 at Macer Hall Funeral Home. Funeral service will be held at 10:30 am on Friday, March 22, 2019 at Macer Hall Funeral Home. Please feel welcome to make a donation to Susan G Komen Foundation in lieu of flowers. Burial will be in South Mound Cemetery. Online condolences can be made at www.macerhall.com. To send flowers or a remembrance gift to the family of Norma Lee McGaha, please visit our Tribute Store. "Email Address" would like to share the life celebration of Norma Lee McGaha. Click on the "link" to go to share a favorite memory or leave a condolence message for the family.